addiChem-APB is a chemical additive and its application include in corrosion inhibitor, in electrolytic capacitors, in fluxes for welding, brazing, soldering and in flame retardant. addiStop-BMC is a chemical additive and its application include in plastics, paper filler, cosmetics, chemical reactions and cement curing accelerator. addiStop-BZC is a chemical additive and its applications include in ceramics pigment, in polychloroprene adhesives, in flame retardant, as activator in rubber, curing agent in polyurethanes, blowing agent in plastics, additive of ointments/lotions and as sulfide scavenger in drilling fluids. It is produced by precipitation method with the sodium aluminate solution from sintering process as the seeds. 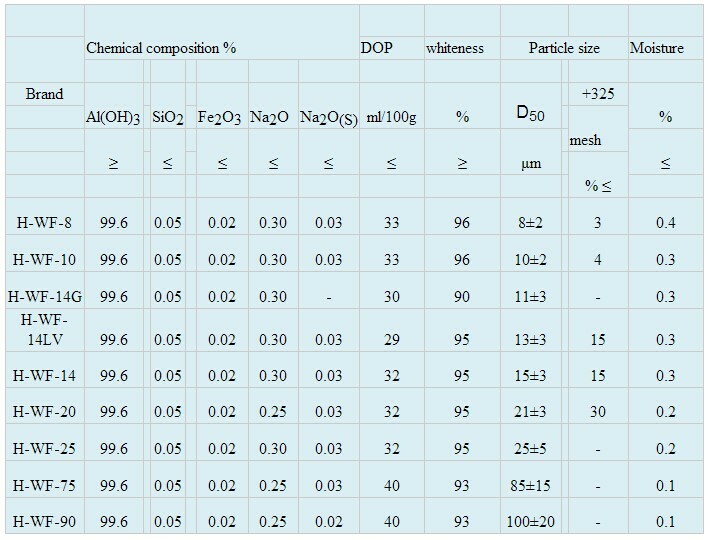 Slow decomposition, complete crystallization, low impurity, high intensity and good penetration. It has the texture properties of jade, which can be used as superior filler in the solid surface, crafts and other composites. High whiteness (has the reputation for Chinese Whiteness), low oil absorption, steady in room temperature and dehydrated to alumina while heating, to make the products have the function of flame retardant. It’s good flame retardant filler because that no toxic and corrosive gases were generated in thermal decomposition. It’s widely used in the solid surface, mould plastics, epoxy potting compound and other composite materials. Chlorinated paraffin 70% is white or light yellow resin-type solid. Average molecular formula is C25H30Cl22, average molecular weight is 1060-1100. It is excellent additive type flame retardant with good chemical stability, excellent flame retardance, good chemical resistance, ageing resistance and heat stability. The product can be used in rubber and plastic products as flame retardant additive for flame retardant conveyor, flame retardant cable material, fire retardant coating, polyester, polystyrene, polyethylene, epoxy, etc. It can also be used as fire retardant additive for ink, as modifier for paper industry. In addition, the material can be used in fiber and other industries as plasticizer, or as surface treatment agent and lubricant for fabric. It is also used as anti-corrosive additive for anti-corrosive paint. Keep in cool, dry and shading place. It is packed by composite paper bag or polypropylene woven bag, 25kg/bag, Handle with care during transportation. White crystalline powder. Taste slightly bitter. Easy deliquescence 44 ℃ loss of a molecular crystal water, 160 ℃ when anhydrous. Soluble in water, soluble in ethanol. Aqueous solution of litmus was neutral or slightly alkaline. The hot concentrated solution dissolves the cellulose. As a highly efficient water vapor absorbent and air humidity regulator. Refrigeration industry is widely used as absorption refrigerants, organic industry for hydrogen chloride decoction agent and organic fiber expansion agent. Medicine for hypnotics and sedatives. The battery industry for high-energy batteries and micro-battery electrolyte. In addition, also used in the photographic industry and analytical chemistry. Can also be used as pharmaceutical intermediates. In 25kg net plastic drum lined with plastic bags or custom packing. a) YR6N Magnesium hydroxide fire-retardant is high purity Mg(OH)2, ,the surface is specially treated with vinyl silane. c) as a no halogen flame retardant,it is mainly used in PA,TPE and Polarity PE copolymer(EVA EEA etc) and also Rubber .Low smoke density and high thermal stability. initial decomposition temperature is about 340?.No Poisonous and causticity air when degradation. d) Because of aminosilane surface treatment,it is good for improving the compatibility of polymer and filler when casting mold and modification.